Wicked Lasers is a company that manufactures and sells its own line up of lasers and flash lights. In their arsenal, they carry the worlds brightest laser that you can legally own. The Spyder 3 Krypton. They also carry other lasers and products. Their core line up consists of 5mW laser pointers that is the world's most powerful FDA certified laser. These feature a class 3A laser so it is perfectly safe for use in presentations and stargazing*. The E3 line up features 75mW, 100mW, and 125mW green laser pointers. The E3 is similar to the core series, the only difference is a larger form factor, more power, and a smooth gun metal finish. The E3 is 50-100 times more powerful than any standard laser pointer. The top line of lasers would be their Spyder3 lineup. The S3 Arctic and S3 Krypton both feature a <1W laser diode and is house in a military grade aluminum housing. 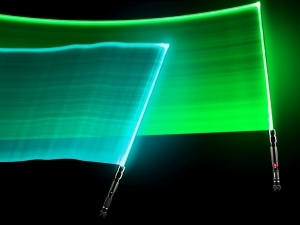 Accessories for the Spyder line up would include expanded lens kits and a very interesting LaserSaber**. The LaserSaber has a 32" strong polycarbonate blade and a hard T6061 aircraft grade aluminum hilt. The laser saber can only be powered by their Spyder line up of lasers and is alot more powerful than the light sabers you can buy at Walmart. Visit their website through this link http://zfer.us/oM0DT for pricing and more information. *As long as it is used responsibly, please do not point it at eyes, planes, or vehicles.